Well hello to you my reader chums! After the massive hype of Revlon's 'colour stay' foundation, I finally caved into buying it a few months back. Over that time, it's easily become my staple foundation, where I rarely reach for anything else. Here's a few reasons why..
Revlon products always have the best looking, classy packaging and this foundation is no different. Given its glass, cylinder shaped bottle, the product looks more expensive than its high street status. As it's see through, you're able to tell not only the shade but how much product is left and when you'll need to restock. My favourite part of the packaging though has to be its pump. I'm pretty sure the pump was added to the foundation bottle quite recently and I can see why. This pump allows for the correct amount of product to come out without spillage or wastage. It's then sealed with a firm plastic lid which again prevents excess leakage. Even though the glass isn't too suitable for travelling, I love how sturdy the product is. It's safe to say I have very pale skin and am usually the lightest shade when I try out new foundations or concealers, otherwise my skin will look orange. However, Revlon's 'colour stay' have fulfilled my wishes with a light range of shades to choose from. Even with the shade selection, I am still the lightest colour but its the perfect match for my complexion. What I love about this foundation is the two different formulations it offers, the combination/oily and normal/dry skin. I use the combination/oily type as I tend to have an oily T zone with the rest of my skin being pretty normal. The formulation is velvety soft and light, blending into the skin with hardly any effort. Coverage is an important factor for me, as I'm not the biggest fan of heavy and full coverage foundations. I prefer something light in thickness which is able to cover up most subtle blemishes, luckily Revlon's 'colour stay' does just that. 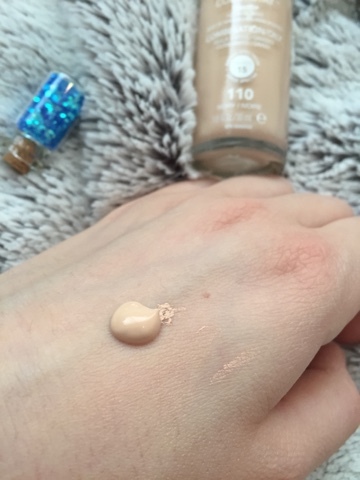 It's definitely a medium coverage but can be worn as even lighter than that as the product is very buildable. Once applied onto the skin, I'd say it's a satin finish, not too matte or shiny. If you'd prefer it more matte finish, a dusting of powder will do the trick. As I have quite an oily T zone, I'm a massive fan of skin preparation to ensure my makeup lasts as long as possible. I haven't tested this foundation without a primer to see if it lasts the '24 hours' it claims, however when I've used primer before hand, this foundation wears well all day long. I get home from work and the makeup is still in place, the same as I'd applied it 8 hours beforehand. Overall, with its velvety formulation, medium coverage, strong lasting game and classy packaging, Revlon's 'colour stay' foundation the one for me. If you have a slightly oily T zone and pale complexion, I'd highly recommend giving it a go. I hope you enjoyed this review. 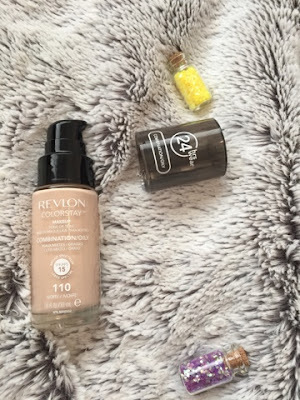 Have you tried Revlon's 'colour stay'? I haven't tried this but it seems to be great! Definitely gonna give it a try. This use to be my holy grail foundation! i must repurchase it sometime! So great to hear that this matched well with your skin, I'm super pale too so I need to look in to this product! Thanks for sharing your thoughts! I've wanted to try this foundation for a while now. I'm excited you said there is lots of pale colours and like you, that's a struggle for me! Great review! I think this might be the foundation I buy for summer of it's a medium coverage. Great review! I do struggle to find a foundation that works with my skin. I might have to give this one a go. This sounds like a really great foundation, I might trial it next time I need a new one!